HUNTINGTON, NY--(Marketwire - August 26, 2010) - With great pride, Frederique Constant introduces a new, passionate initiative, exclusively for the United States of America: The Frederique Constant for Cohiba Limited Edition Timepieces. 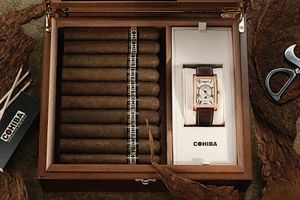 Frederique Constant and Cohiba will be launching these exclusive timepieces during a dedicated event on September 22nd, 2010 at Club Macanudo in New York City. In the setting of New York City's premier cigar bar, restaurant and lounge. Long Island Jewelers and fine Timepiece stores will be carrying the limited edition watch early October, 2010. Maddaloni Jewelers is honored to be the retailer of these two exceptional watches that reflect the style and atmosphere of the Cohiba brand. With its smooth case inspired by 'Toro' shaped cigars, the warm, ivory colored dial, the tobacco brown Roman numerals and the hand-sewn tobacco brown Crococalf strap, these watches form a tribute to the high-profile cigar brand that achieved 'cult' status under discerning connoisseurs the world over. Presented in a luxurious giftbox that doubles as a humidor, and produced in a very limited edition of 188 numbered pieces in steel and 188 pieces in rose gold plated, these watches are already 'smoking hot' before their launch! The Dominican Cohiba cigar was reformulated in the 1990s and is the only Cohiba cigar that can be purchased legally in the United States. This limited edition timepiece set is the result of the cooperation between Frederique Constant SA & General Cigar Company Inc., the largest cigar company in the USA. Maddaloni Jewelers is an official Frederique Constant retailer. Frederique Constant is an independent family owned watch manufacturer based in Plan-les-Ouates, Geneva. The company manufactures Alpina timepieces as well. Frederique Constant contracted with Maddaloni Jewelers in 2004 to be an official retail partner. In 2005 Maddaloni became authorized to repair the fine watches through their state-of-the-art timepiece center. Maddaloni has one of the largest selections of fine timepieces and engagement rings in the country.